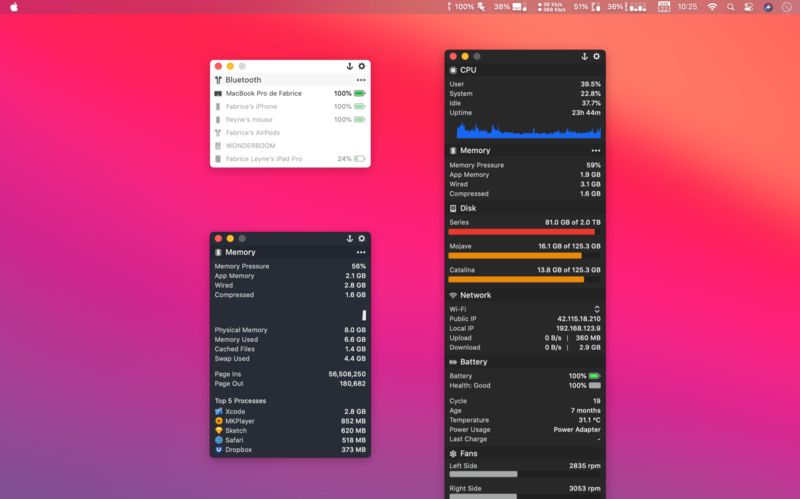 MenuBar Stats 2 has been reinvented. Completely re-written from the ground up. 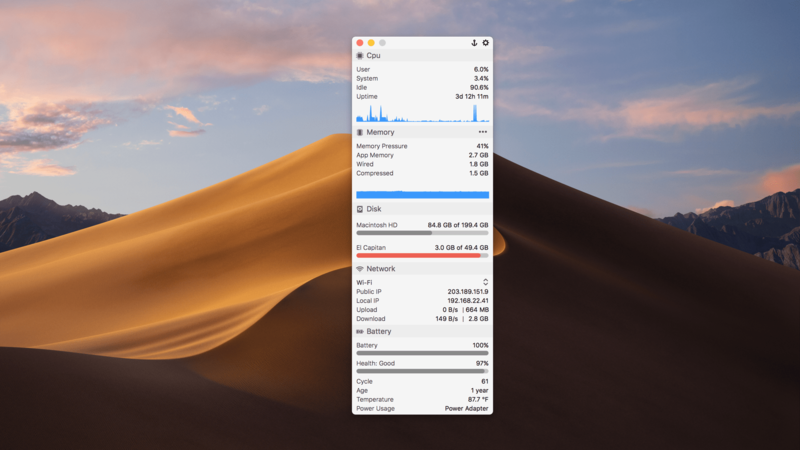 MenuBar Stats 2 is composed of modules (CPU, Disk, Network,...). Each module can be seen in your menu bar. Each module can be combined in 1 window, or in a separated window. You can display a concise information, or a maximum of detailed information including graph, top processes and more. Get notifications for your battery health or from other modules. 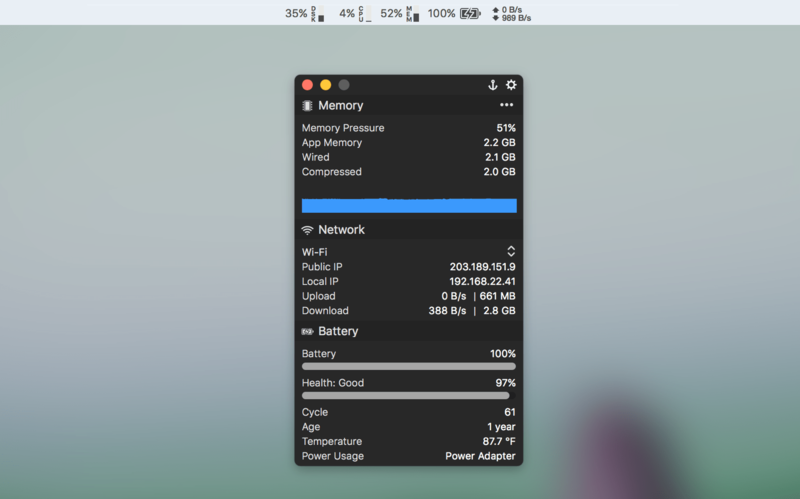 MenuBar Stats 2 has been architectured to add free extra plugins. Your Macbook battery deserve care, the battery module comes with notifications for you to be notified when to plug, or unplug your charger. 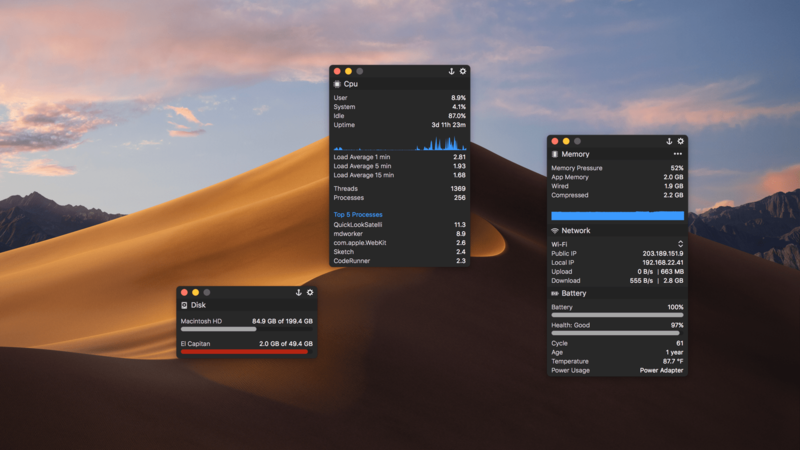 MenuBar Stats 2 is built to handle plugins at its core. You can add free plugins such as Temperature and Fans, or develop your own. 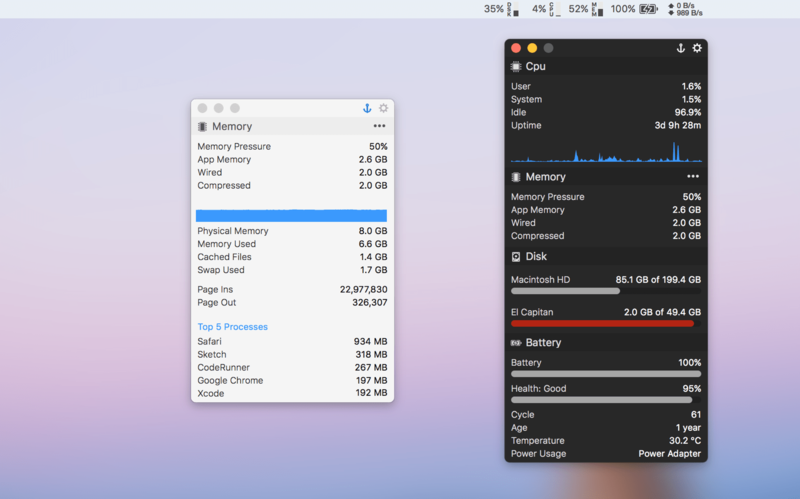 Get instant information about the health of your Mac, by looking at your menu bar. 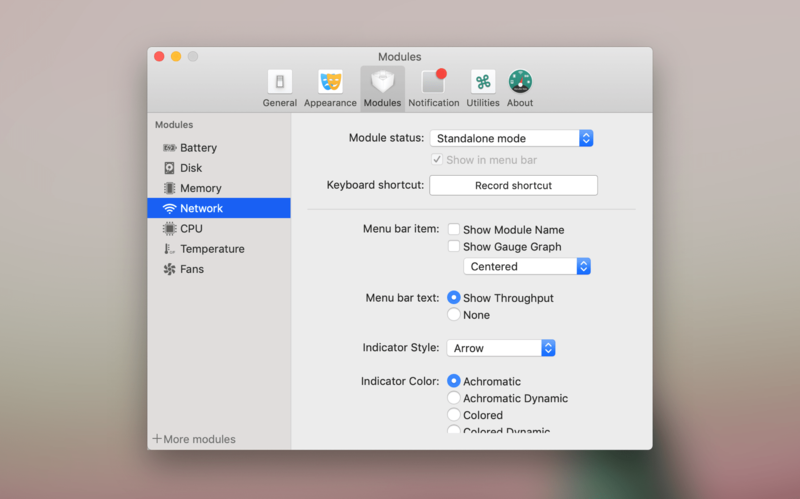 All modules can be added to your menu bar. While in combined window mode, all the module icons are embedded in 1 master item (same way as Apple does with macOS stock menu bar items). To rearrange them simply order your items with [shift] Drag & Drop. While in separated mode, you can rearrange your items with [cmd] Drag & Drop. If you use the Dock mode, you can access your modules directly from the Dock. As mentioned above, MenuBar Stats 2 has been totally reinvented. It has been re-written with one master guide line, to manage plugins regarding the system monitoring. The 5 basic modules, are actually 5 plugins. You can add extra modules with the MenuBar Stats Plugins Manager. Such as Temperature plugins or Fans plugins. Look at each module individually in separated window mode, or combined. You can look at all your modules in separated window mode simultaneously! While in separated window mode, you get generally more detailed information. If you prefer, you can combine all the modules in 1 window, and simply rearrange the order by Drag & Drop. There is no limit for the number of modules. If there is need for space more than your screen, then the window will automatically activate the scroll view mode!